Frank Francisco took the blown save and loss for Tuesday’s brutal meltdown in the Bronx, but manager John Farrell should also get an “L” for this one. There’s no way Marc Rzepczynski should have been allowed to face Russell Martin in the eighth inning with a runner on second. Martin, a right-handed hitter, drilled a single to centerfield for his second RBI of the game, bringing the Evil Empire to within 4-3 heading into the ninth. Francisco couldn’t hold the lead and the Jays lost 5-4 to the Yankees despite another outstanding game from Ricky Romero, whose ERA dropped to 2.91. When J.P. Arencibia launched a rocket for his eighth home run of the season on Sunday he did it with no one on base. It was a big hit, but not the big hit the Jays were searching for all afternoon. They stranded 11 men on base and went 1-for-8 with runners in scoring position, and that “1” — a single by Edwin Encarnacion that should have scored Rajai Davis from second — didn’t result in an RBI. So they lost 3-2 to the lowly Houston Astros at the ’Dome and are now 7-10 in one-run games as they head into a three-game series in the Bronx against the Evil Empire. Arencibia’s homer in the sixth was the game’s final run, even though the Jays had runners on in each of the final three innings and loaded the bases in the ninth. But Aaron Hill grounded out to third base and the Blue Jays fell back to .500 (23-23). Houston (17-3) left town with a series win. The Daily J.P. Arencibia to Cooperstown Watch, Day 20: A homer and a d’oh! J.P. Arencibia homered on Wednesday night. J.P. Arencibia did his best impersonation of Forrest Gump on Wednesday night, running and running and running. First time around that was great. Arencibia hit his third home run of the season — and first since Opening Day — and trotted around the bases coolly to pull the Blue Jays a run closer to the Yankees in the second inning. Then, after striking out in the fourth, Arencibia walked in the seventh and seemed to get happy feet during the Jays’ 6-2 loss to AL East leaders. Travis Snider singled to right field and Arencibia went first to third, which would’ve been a great piece of base running if Edwin Encarnacion, who had doubled earlier in the inning, hadn’t been given the stop sign. 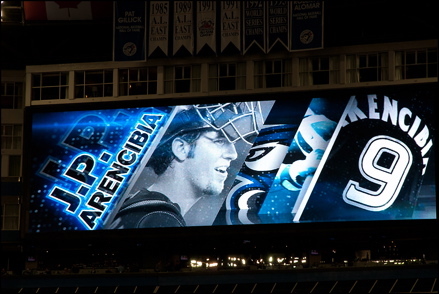 Encarnacion didn’t go home and Arencibia didn’t pick up the signal. Both Blue Jays ended up on third; Arencibia was tagged for the second out of the seventh. Instead of a potentially big inning, the Jays ended up with just one run — when Jayson Nix singled home Encarnacion — and trailed 5-2 at the ’Dome. They couldn’t replicate the heroics from Tuesday night and fell again to two games below .500 (8-10). Reliever Frank Francisco, making his season debut, gave up a homer to Mickey Mantle, er, Curtis Granderson in the ninth for the Yankees’ final run. Few things in life are sweeter than beating the Yankees. Watching Mariano Rivera disintegrate in the ninth inning just makes victory all the more delicious. The Blue Jays rallied from two runs down against the major league leader in saves to send Tuesday’s game to extra innings and then pulled out a 6-5 win, their biggest of the season. Travis Snider, who needed a hit as much as Charlie Sheen, ripped a 1-0 fastball to the right-field gap off of Ivan “No Need to Call Me Super” Nova, scoring Edwin Encarnacion from first base with the winning run. J.P. Arencibia joined the mob as the Jays congratulated Snider as if he had just lost his virginity. It wasn’t far from the case. Snider had been down-right impotent, going 0-for-6 and seeing his batting average plummet to the level of Kate Moss’s weight. But the double in the 10th inning erases a lot of the sting of failure for the leftfielder. While that’s great for Snider, it was the ninth that the Jays will be happiest about. Mo Rivera entered the game 7-for-7 in save opportunities without allowing an earned run. The Jays (8-9) trailed 5-3 but got to him right away as Yunel Escobar doubled to center field and moved to third on an out by Snider. Escobar scored on a wild pitch that was also ball four to Jose Bautista. Adam Lind followed that walk with a liner into right field that put Bautista on third.